This is another great one by the author of Code Name Verity. It’s a companion piece to that book and begins in Great Britain, 1944, just about where Code Name Verity let off. While one of the characters reappears here, the protagonist, Rose Justice, is new. She’s a bit of a naïve, idealistic girl from America—small town Pennsylvania—who’s a pilot. And like Maddie from Code Name Verity, she wants to help out in the war effort by taxiing planes for war missions. Rose is taking a Spitfire from France to England when she sees an unmanned V-1 flying bomb and decides to try to knock it out of the sky before it reaches its target. Her effort at heroics gets her into big trouble. Ultimately, she is driven into Germany by two fighter plane pilots and becomes a prisoner of war there. We think things won’t be too bad for her since she’s a noncombatant. And at first it appears that her prisoner experience will just consist of unpaid factory work. But she figures out that she is assembling bomb parts and then refuses to cooperate. In punishment for this, she is so severely beaten (more than once) that she almost doesn’t survive. And it is during these beating that she harkens back to poetry—both her own and what she has memorized—to try to heal. In addition to her beatings, she is sent to Ravensbruck, a now notorious women’s concentration camp. There, her nightmare becomes a continual struggle for survival against cold, extreme hunger, bizarre punishments, and horrifying labor such as piling up dead bodies to be thrown into the gas chambers. 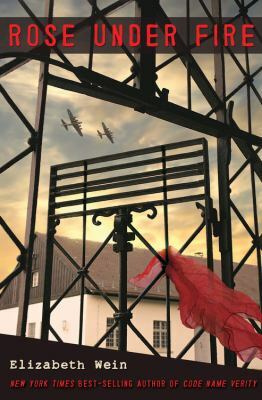 Rose’s one bit of luck at Ravensbruck is that she is taken in by the ‘Rabbits’—Polish girls who are being used in the most sadistic sorts of medical experimentation. She learns loyalty with this group and what it means to risk one’s life so that the truth will come out. High school housekeeping: Rose under Fire has a diary format, written in a hotel room, so you know right away that Rose has survived her experience. I questioned this choice because I thought it would be a suspense killer. And while I still think that a straightforward format would have been superior, the diary format works. There are some very suspenseful moments because not everyone the reader cares about can survive—the odds against these girls and women are great. And there is a lot of adventure in attempted escapes, even in the little protests that prisoners make to defy their Nazi captors. Small acts of disobedience that can cost them their lives. One of the things that sets Rose under Fire apart from other Holocaust novels I’ve read is that the story continues with the aftermath of war, giving us a view of bombed-out Europe and, more importantly, a sense of what happened at the Nuremberg Trials. The Rabbits who survive have a chance to testify against the sadistic doctors who tortured them with medical experiments. But even facing these tormentors is difficult, impossible for some. The creepiness factor here is extreme. As she did in Code Name Verity, Wein has an afterword that discusses the research for the novel—which elements are facts and which things she had to consolidate for the sake of space and clarity. It’s good to be able to see what she did and why she did it. In addition, there are the many wonderful poems—some of them, in a few perfect words, bring home the sheer dread that prisoners lived. I recommend this one to all teens and adults alike. This entry was posted in Adventure Stories, Fiction, Historical Fiction/Historical Element, Human Rights Issues, Young Adult Literature and tagged book reviews, Code Name Verity, Elizabeth Wein, fighter pilots, France, Germany, Great Britain, historical fiction, pilots, Rose Justice, Rose under Fire, women air pilots, women's issues, World War II, YA fiction, YA literature. Bookmark the permalink.